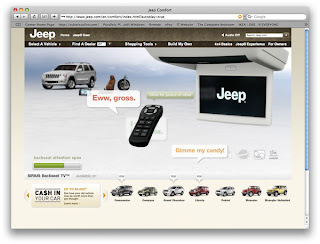 Jeep's site has personality peeking around every corner. Sad to say, it's a factor that is overlooked in most manufacturers websites. 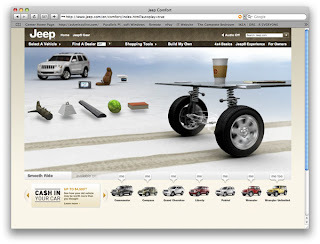 Jeep also has a thriving community base, but today I'm more interested in clicky/draggy things. Take what we saw at BMW yesterday and then see how pro's do it. (gotta give props where due). 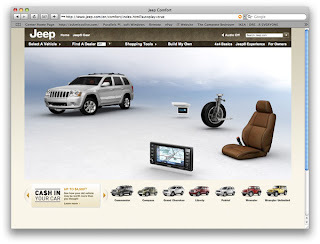 This is a masthead demonstrating features for the Grand Cherokee. Fluid, clean and oozin with clickosity (the factor that makes you want to click things). The DVD section has you picking up the remote and changing the channels (Nickelodean, Disney etc) before the "Backseat Attention Span" runs out. Heated seat demonstation. 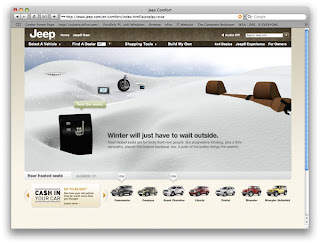 Starts out with tons of snow (above), but when you click the heater the snow melts. KISS. This section is the jewel for the interactive junkies. You drag and drop an object onto the road and watch the wheels run over it. Of course, the coffee never spills. Now isn't all this better than some video?